Brandon Cross is an enterprise software company which offers both development and deployment services as well as a range of bespoke software assets. The business is focused on creating software solutions for commercial enterprises and organisations in the charity sector which improve workflows, add value and provide greater security among other things. Established in 2006, our team offers the right balance between technical expertise and the ability to listen properly to what it is our customers actually need. At Brandon Cross, we pride ourselves on our core business values, which our clients appreciate greatly. These include our friendly and respectful approach. This isn’t simply extended to our customers, of course, but involves a great deal of openness when it comes to new ideas and approaches in the sector. Part of this is keeping our clients informed of what is going on with their project as well as being attentive to their needs in the first place. We find that being open and informative is the best way forward. Put another way, we value honesty and integrity and we’re sure that this focus on values is what marks us apart from other enterprise software developers. As well as providing a top team of software experts who can make your IT business goals a reality, Brandon Cross is set up to provide a cutting edge for clients who currently rely on legacy software systems. We know that many organisations know their software needs to be updated but are unsure how to proceed. This is where our development team can help them to obtain a competitive edge and to meet the modern demands for things like data security compliance, for instance. When it comes to deployment, the team is no less efficient, affording guidance throughout the rollout process of new systems, from custom workflow software to artificial intelligence solutions. Tell us about your project and find out how we can help. Contact us for a no obligation chat and we are sure that you’ll be impressed. 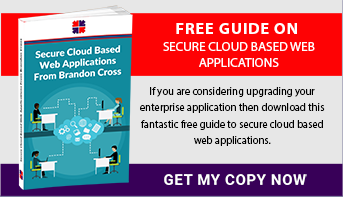 Alternatively, you can simply download our free guide – Secure Cloud Based Web Applications – to find out more about the sort of software solutions we provide to modern businesses.